Open the task by double-clicking it. Click the Recurrence button on the Task Form toolbar (or press Ctrl+G). The Task Recurrence dialog box appears. Choose the Daily, Weekly, Monthly, or Yearly option to specify how often the appointment occurs. Each option — Daily, Weekly, Monthly or Yearly — offers you choices for when the task recurs. For example, a daily recurring task can be set to recur every day, every five days, or whatever. A monthly recurring task can be set to recur on a certain day of the month, such as the 15th of each month or on the second Friday of every month. In the Recur Every box, specify how often the appointment recurs, such as every third day or the first Monday of each month. If you choose to create a monthly task, for example, you can click the scroll-down buttons (triangles) to choose First and then choose Monday to schedule a task on the first Monday of each month. Choose when you want the appointments to stop (no end date, after a certain number of occurrences, or at a certain date). Click the OK button and then click the Save & Close button. 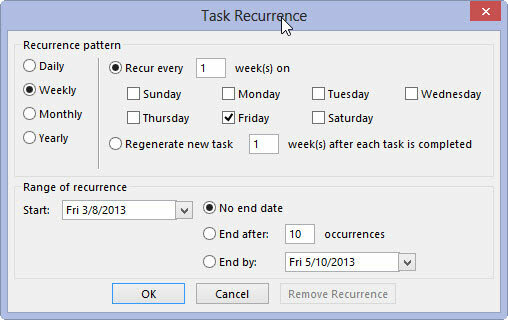 A banner appears at the top of the Task form describing the recurrence pattern of the task. 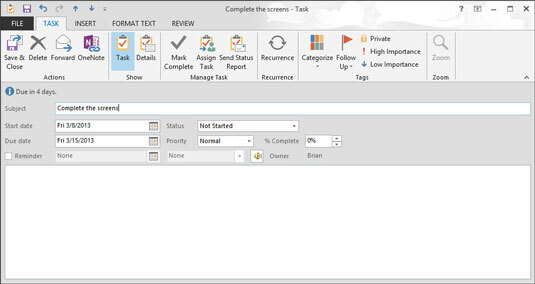 Your task appears in the list of tasks once, but it has a different type of icon than nonrecurring tasks so that you can tell at a glance that it’s a recurring task.